August 31, 2016 – Assembly of the Orion crew module for the first uncrewed flight test atop NASA’s Space Launch System reached a significant milestone this month in the Neil Armstrong Operations and Checkout Building high bay at the agency’s Kennedy Space Center in Florida. Lockheed Martin, manufacturer of Orion, and its subcontractor engineers, technicians and X-ray specialists completed the first propellant system tube welds on the exterior of the Orion pressure vessel. Orion’s propulsion lines are comprised of multiple metal tubes of varying lengths that are welded together around the vehicle. With the first tubes in place, X-ray specialists performed inspections of the welds for any imperfections. This process will be repeated as each of the remaining tube assemblies are completed along the exterior of the crew module in the clean room. The propellant lines will provide hydrazine to the spacecraft thrusters during missions into deep space. The propellant lines complete a continuous connection from the propellant tanks in the aft bay of the crew module to the spacecraft’s thrusters, which are part of the system that helps to steer the capsule during the mission. “These first propulsion system welds marks a significant transition during the build-up of the crew module, signifying the completion of the structures assembly and the beginning of the fluid systems integration,” said Jules Schneider, Orion KSC operations manager with Lockheed Martin. 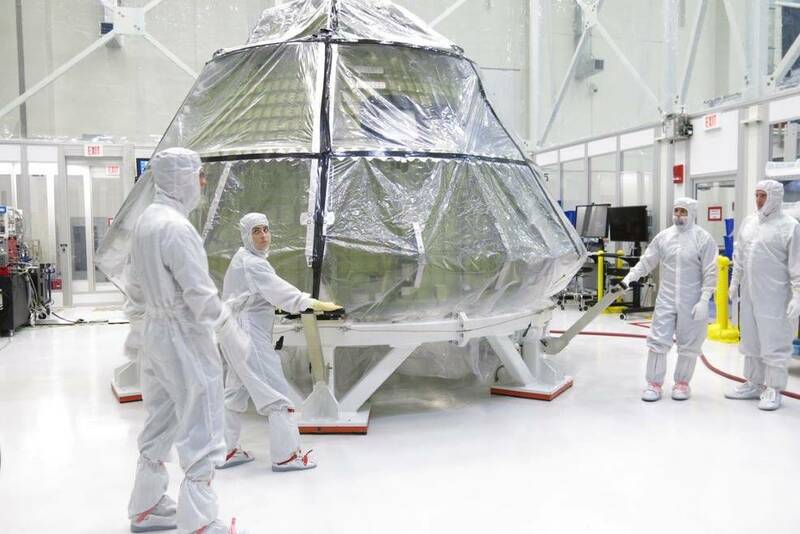 Orion was moved from the birdcage assembly fixture and secured in the clean room for the first time in late July. The first propellant system weld was completed in the clean room. The spacecraft’s critical systems, including the Environmental Control and Life Support System and propellant lines, will be completed in this room. Orion is the NASA spacecraft that will send astronauts to deep-space destinations, including on toward the journey to Mars. The pressure vessel will contain the atmosphere that a crew would breathe during a mission. It also will provide living and working space for the crew, and withstand the loads and forces experienced during launch and landing. The SLS rocket with Orion atop is targeted to launch from Kennedy’s Launch Pad 39B in 2018. EM-1 will send Orion on a path thousands of miles beyond the moon over a course of three weeks, farther into space than human spaceflight has ever travelled before. The spacecraft will return to Earth and safely splash down in the Pacific Ocean off the coast of California. The mission will advance and validate capabilities required for human exploration of Mars. “Our human journey to Mars is underway. It is milestones like these that mark our progress to deep space,” Wilson said.